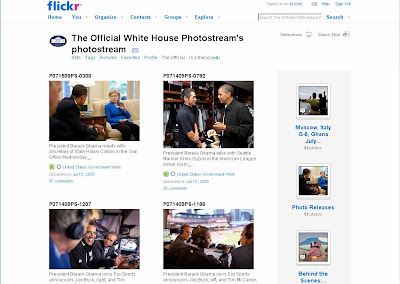 It is interesting to note a new category on the photo-sharing site Flickr: "government work." It's a choice that suggests certain forms of authority and proprietary interest that is very different from the term "public domain," which appears on other digital files on the site. (See above for how the term is used on the White House Flickr stream. Click to enlarge.) In contrast, the Library of Congress's Flickr site suggests that many of their images have "no known copyright restrictions," although they don't go so far as to make public domain claims, even for images created over a hundred years ago by government employees. The Flickr stream for the State Department is still using the Creative Commons license, although it is likely that they will soon follow the White House lead.